Still considering what to decorate your Thanksgiving courtyard? This YUNLIGHTS Lighted Air Blown Inflatable Turkey is your best choice. This Thanksgiving Turkey is not only big, but also lifelike. It comes with light, which perfectly works both day and night. It will accompany you and your family. It will be a faithful friend. This Inflatable Turkey is made from sturdy plastic and other components, with strong seams to prevent leaks. It packs down to a small size for storage and will last through year after year of use. THE BEST DÉCOR IN THANKSGIVING-Easily and Stylishly Put this tall air blown turkey on your yard or somewhere else and you will see how greatly surprised your family and neighbors will become. This huge turkey can accompany you and your family, it will encourage more play time together with your children. At evenings this Turkey will send a beautiful light, and decorate your courtyard and change every dull time to fun time!. 6 Ft HUGE TURKEY-This is a really tall Thanksgiving turkey, just like an adult who accompanies you with Thanksgiving. You will love it, your family will love it and your neighbors also love it. This is the best gift for you and your family. 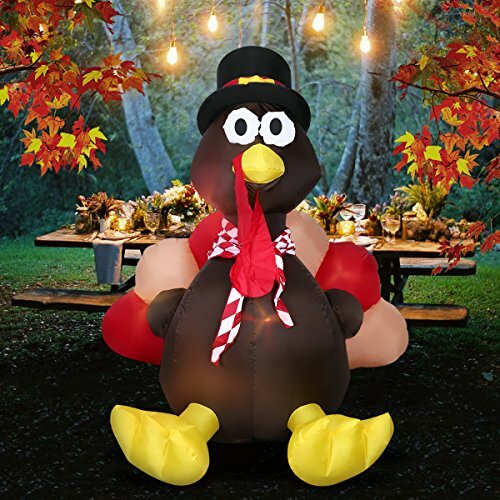 A BEAUTIFUL LIGHTED INFLATABLE TURKEY-This blow up turkey has three groups of LED lights, each group has three led lights. Respectively, in the head, body and tail. EASY TO OPERATE AND SAFE-Simply plug in the power and the built-in blower will give the turkey its perfect shape the lights will also come up. This Turkey has a built-in fixed sandbag, please put the turkey in the middle. And then use the pile, rope and mountaineering buckle together for easy fixing.